Ok so this is Enzo, my love, who goes everywhere with me! I call him “love bug”! Enzo was rescued from California after his entire family was wiped out after being run over by a car. The lone survivor, tiny Enzo, was found by the side of the road by racing friends of mine. They knew he was going to be a big breed of dog so they couldn’t keep him. That is when I decided to take him in. After tender loving care Enzo has grown to be over 80 pounds and is all muscle! Enzo is now just over a year old and a very healthy happy dog. But he has one very bad habit! He chews shoes!!!!! I can’t leave him in a room for even a moment and a shoe will be gone! And not sure how he does it, but he manages to get the most expensive one! So I decided to look into ways to stop the destructive chewing behavior! Some dogs can destroy an entire room, my Enzo just destroys shoes! Dogs chew because they have teething discomfort, separation anxiety, or just plain old boredom. Dogs tend to use their mouth to explore things along with their sense of smell. I can tell you that Enzo must have an exceptional sense of smell because he is usually drawn to the most expensive beautiful shoes! So what can you do if you dog is a chewer? Don’t scold the dog: Showing the dog anger is not going to solve your problem. It will, in fact, only make the problem worse. Your dog will go after something else to chew to calm down. Correct your dog by using a firm quick NO: Don’t grab the object, use a light touch to take the object away and get your dogs attention away from the object. Distraction is very effective. Redirect the dog’s behavior: Give your dog a safe chew toy. My go to brand for the best tough dog toys is Nylabone. These tough toys for dogs come in a variety of sizes for small to extra-large breeds. These chew toys are Veterinarian recommended. Tough dog toys satisfy a dogs need to chew! These bones will keep your dog healthy, happy, busy and entertained! My Enzo loves the Nylabone natural “Daily Health Roast Beef”. It not only serves as a great chew toy but contains minerals and vitamins. Other Nylabone chew toys he loves is the Dura Chew Axis Bone and Dura Chew Antler Alternative. 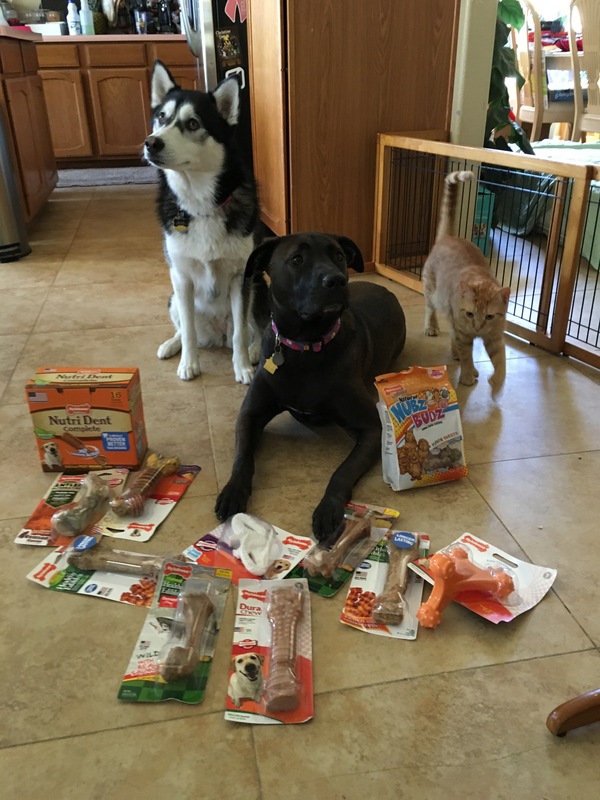 I have used Nylabone brand in the past and will continue to use them for all my current 4 pets. Additionally try freezing the safe chew toy. Soaking and freezing the safe chew toy helps the dog’s gums swelling and they will find faster relief from teething. Even Nylabone can be frozen and given as a positive treat. I will warn you, that your dog may be sitting by the freezer door when you get home waiting for their frozen treat. Sometimes these measures are not enough. Trust me, I know. So I also suggest putting away the good stuff like heirlooms and valuables! Don’t chance it. Dogs have a fascination with shoes, socks, plastic dishware, wood and the list goes on and on. Pets think everything within their reach is fair game. It is up to you to help them understand boundaries. Be sure your dog has a sort of toy chest. Fill the chest up with their favorite plaything and safe Nylabone tough chew toys. Rotate these toys now and again so your pet doesn’t get bored. Lastly when you are not at home, leave your dog in a safe place. I encourage crating for your dog or restricting him to a certain part of the house. Again, be sure to keep toys and Nylabones in this area. This will encourage constructive chewing instead of destructive. For more information on Nylabones go to their website. http://www.nylabone.com/index.php Search the website for places to get the quality products, dog videos, dog house chatter and my favorite Dog 101.